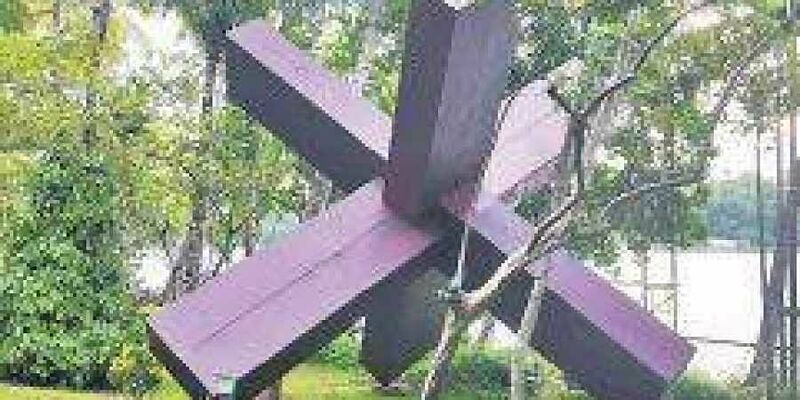 KOCHI: Art director and painter Rajasekharan Parameswaran has a huge problem on his hands. In fact, it is so huge, it is a Guinness World Record.Rajasekharan has built an ‘edakoodam’, which is a Rubik’s Cube-like puzzle. Made up of six wooden blocks, the edakoodam, once dismantled, can be put back into its original shape only with mathematical skills. Rajasekharan’s huge edakoodam, breaks the current Swiss record.The artist has many accolades to his credit, and is keen to constantly innovate and explore new mediums. He wanted to break the record of largest wood block-puzzle held by Foffa Conrad in Valchava, Switzerland. “I was always fascinated by edakoodams as it requires a lot of mathematical skill. When I heard about the record by the person in Switzerland, I thought of making an edakoodan bigger than that. So, I informed the Guinness authorities about the plan to break the previous record,” he said.Rajasekharan made his edakoodam using a wood and metal frame. This ‘devil’s knot’ measures 7.30 metre in length, 0.60 metre in width and 0.60 metre in height, breaking Conrad’s record puzzle which measured 6 metre in length, 0.40 metre in width and 0.40 metre in height. The edakoodam now exhibited at the Raviz Hotels and Resorts, Kollam. Breaking a record is not new for Rajasekharan as he holds a Guinness record for the largest easel painting - 56.5 ft x 31 ft - portrait of late Communist leader E M S Namboodiripad in 2008. Rajasekharan, popularly known as Marthandam Rajasekharan, is also the recipient of the state award for art direction for Adoor Gopalakrishnan-directed feature “Naalu Pennungal”. The film marked his debut work as an art director. When asked about how he was drawn to art and especially making edakoodams, he says, “I used to play with the toy from my childhood days. In college, I studied mathematics. This taught me ways to assemble edakoodams,” he said. The artist adds that the structure that he has installed in the Raviz is the blow-up version of the small ‘edakoodam’.